The FYE: A Glimpse Into India course presents “A Cartoonist’s Journey” a conversation with Shreyas Navare, Editorial Cartoonist, Hinustan Times Founder & CEO, LÉGENDE. 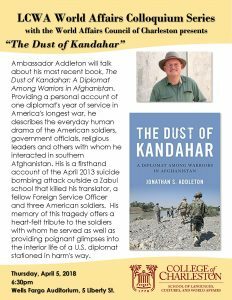 It will be held on Monday, April 2nd from 6:00 – 7:00pm in the Simons Center for the Arts, room 309. 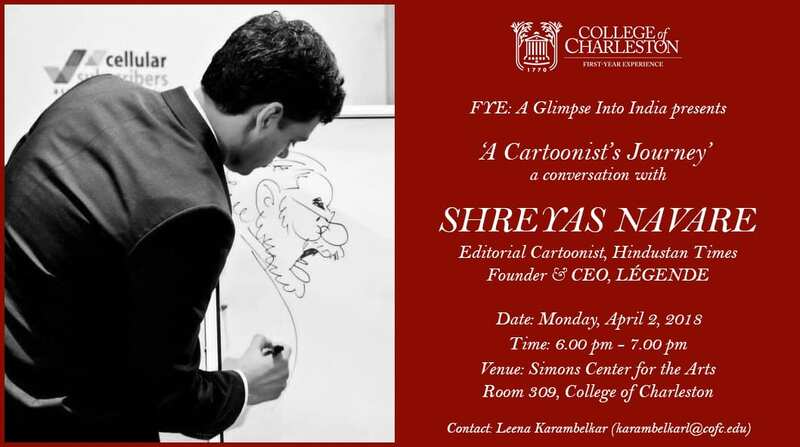 For further information please contact Leena Karambelkar at karambelkarl@cofc.edu. 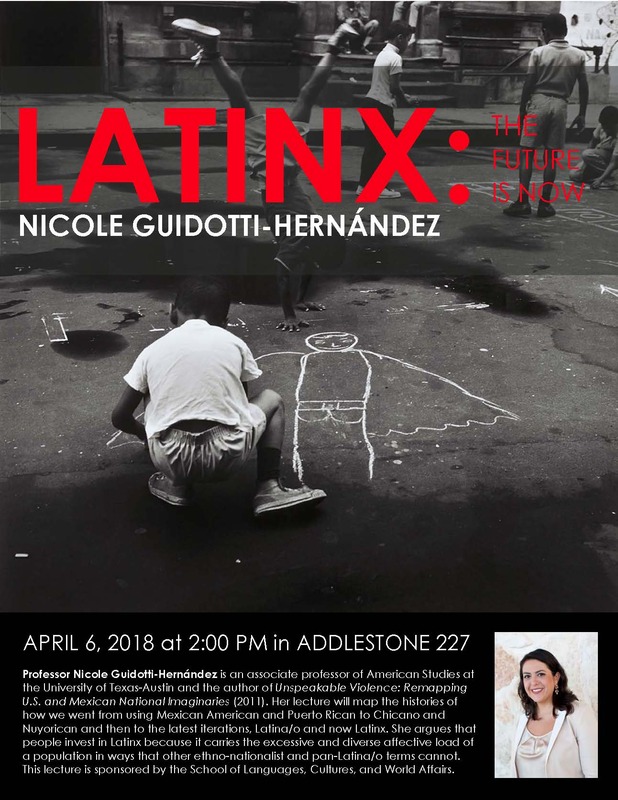 In conjunction with Professor Crabtree’s LCWA Junior Faculty Colloquium, Nicole Guidotti-Hernández will deliver a public lecture titled “Latinx: The Future is Now” on April 6 at 2:00 pm in Addlestone 227. 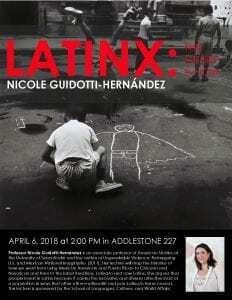 This lecture charts out the histories of how we went from using Mexican American and Puerto Rican to Chicano and Nuyorican and then to the latest iterations, Latina/o and now Latinx. By drawing on specific bodies of evidence both in the creation of new-phase ethnic studies departments in the 2000s and public digital discourse, I demonstrate that while millennials are leading the charge with the Latinx conversation, their boomer intellectual forerunners not are ready for and are often outright resistant to the use of Latina/o let alone Latinx, indicating the futurist potential and political necessity of the term. In making a historical argument about terminology linked to the fields of Mexican American, Puerto Rican, Chicana/o and Latina/o Studies, I show the work of hegemonic logic in how majority minority populations shape discourse with their mere numbers and their access to discourse: print, digital, and aural. To be a part of the affective community is antiessentialist because Latinx bears the load of recognition and diversity and represents the power of inclusion without speaking for everyone. Ultimately, people invest in Latinx because it carries the excessive and diverse affective load of a population in ways that other ethno-nationalist and pan-Latina/o terms cannot. The African American Studies Program will be offering a new course in the Fall 2018 semester, “The Life and Writings of James Baldwin.” This is a pilot course for a variable topics seminar, “The Africana Intellectual Tradition,” which will be added to the curriculum in the next couple years. The literary and cultural icon James Baldwin was a prophetic and radical voice for racial justice at the height of the Civil Rights Movement and in its aftermath. This seminar examines Baldwin primarily as a writer through his essays, novels, and plays, but also analyzes his role as a ‘witness’ to the Black freedom struggle in the US and abroad. Major themes in the course include race and sexuality, diasporic connections, history and memory, impiety (religious and otherwise), and the role of the artist in public life. Reading assignments from his body of work will be paired with critical texts and films by his contemporaries and scholars from Audre Lorde, Toni Morrison, and Ralph Ellison to David Leeming, Raoul Peck, and Douglas Field. 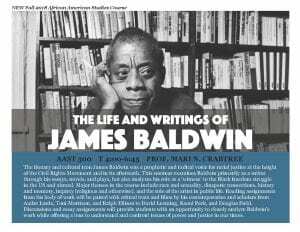 Discussions and essay assignments will provide students with an opportunity to closely analyze Baldwin’s work while offering a lens to understand and confront issues of power and justice in our times. Please contact the professor for this course, Mari N. Crabtree, with any questions at crabtreemn@cofc.edu.